This simple recipe for preserved garlic in oil is very much a French thing and an extremely useful thing to have around the kitchen for making all sorts of dishes. It makes a great foodie gift for Christmas too, perfect for those Christmas hampers. I love flavoured oils and vinegars. To me they are a larder basic that save me hours of time and make cooking so much simpler, especially in the winter months. 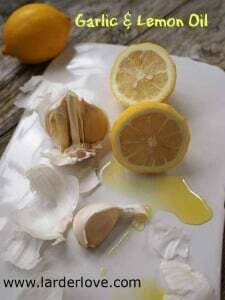 This lemon and garlic oil is wonderful as a salad dressing and also as a base oil for cooking.